Leadership expert, John Maxwell gleans timeless principles from the lives of several Old Testament heroes. Noah warns us not to "fear the impossible", David encourages us to overcome adversity, and Rebekah reminds us to give and serve generously. About "Running With the Giants"
How would the legendary figures in the Bible advise us today? We're running the race of our lives and it's a long one. We need encouragement along the way-"a cheering grandstand or a personal trainer or two. John Maxwell reminds us that even in a modern world, the greatest inspiration is still found within the pages of the Old Testament. In RUNNING WITH THE GIANTS, Maxwell brings those great personalities to life. David would remind us how to overcome adversity. Noah would tell us not to fear doing the impossible. And Rebekah would urge us to give and serve generously. Each of these and the many other biblical figures Maxwell examines can motivate believers toward their personal best in the marathon of life. Motivational guru John C. Maxwell finds inspiration and encouragement in the lives of Old Testament personalities. John C. Maxwell is an internationally recognized leadership expert, speaker, and author who has sold over 13 million books. His organizations have trained more than 2 million leaders worldwide. Dr. Maxwell is the founder of Injoy Stewardship Services and EQUIP. Every year he speaks to Fortune 500 companies, international government leaders, and organizations as diverse as the United States Military Academy at West Point and the National Football League. A New York Times, Wall Street Journal, and Business Week best-selling author, Maxwell was one of 25 authors and artists named to Amazon.com's 10th Anniversary Hall of Fame. Three of his books, The 21 Irrefutable Laws of Leadership, Developing the Leader Within You and The 21 Indispensable Qualities of a Leader have each sold over a million copies. - Publisher. 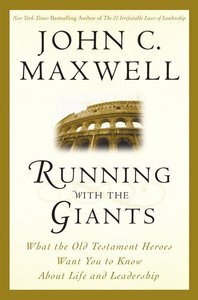 Customer Reviews For "Running With the Giants"
In this small but power-packed book, leadership guru John C. Maxwell reminds us that in the race of life, we are not alone. We are, in fact, surrounded by a cloud of witnesses who have gone on before us, are cheering us on, and would like to impart to us important lessons they have learned about life and leadership. These witnesses include ten biblical heroes whom Maxwell has judiciously chosen. From each of them, Maxwell distills ten lessons about life and leadership which are simply and clearly explained in his book. These lessons include: (1) "One person can make a difference" (Noah), (2) "God has a place for you" (Esther), (3) "Don't give up on your dream" (Joseph), (4) "Live in the faith zone, not the safe zone" (Moses), (5) "Give generously to others" (Rebekah), (6) "God always does the right thing" (Abraham), (7) "No problem is too big when you have help" (Nehemiah), (8) "One small act can make a big difference" (The Servant Girl of Naaman), (9) "You can overcome the limitations others put on you" (David), and (10) "Strengthen a leader and save a nation" (Jonathan). Accompany every lesson from a biblical hero is a discussion guide which one can use for personal reflection. Maxwell's book is a helpful tool that any pastor or leader can use for leadership development.